The Sennheiser DW Pro 1 USB has proved to be the best wireless headset for speech recognition applications, including Dragon Dictate. How much will owning the best speech recognition headset save you? estimate that their keyboard usage has been reduced by around 95%. Would you be happy with 95% less keyboard usage? dictating complex reports, are achieving such a high recognition rate that they find it difficult to operate without their headset. AAAHeadsets can ship this headset to you on the same day that you order it - no more waiting. 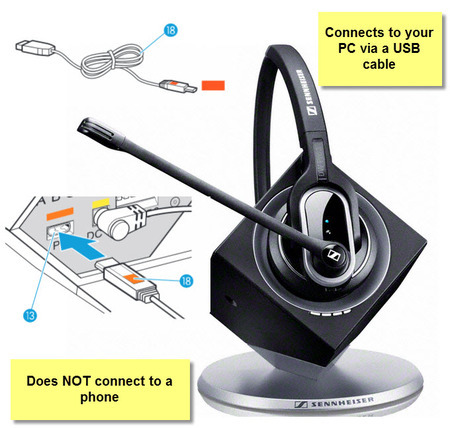 You will usually have your Sennheiser DW Pro 1 USB wireless headset 24 hours from ordering (this depends upon the courier). The DW Pro1 USB is a single-sided DECT wireless headset that can be used for all your softphone and computer applications. It is specially designed to meet the needs of all-day users and experienced professionals alike. This headset looks and sounds great with Sennheiser best-quality speakers and ultra-noise cancelling microphone.